ATP synthases are key elements in cellular bioenergetics and found in every domain of life. A1AO ATP synthases from archaea can be regarded as chimera between F1FO ATP synthases and eukaryotic V1VO ATPases. To unravel their subunit composition and study their function we have purified the A1AO ATP synthases from the hyperthermophiles Pyrococcus furiosus and Thermococcus onnurineus. In addition, we have recently obtained genetic evidence for an archaeal ATP synthase in the anaerobic bacterium Eubacterium limosum KIST. All are Na+ translocating enzymes and have very unusual membrane-bound rotor composition with a c subunit with four transmembrane helices but only one ion binding site that, by current hypothesis, would prohibit ATP synthesis. Nonetheless they do form ATP in vivo. 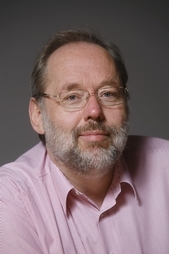 Our project aims to (i) determine whether the physiological consequence of having a double hairpin c subunit with only one ion binding site is a lower cellular phosphorylation potential, (ii) proof and energetically characterize ATP synthesis, (iii) determine their structure with a special focus on the c ring composition, and (iv) address by mutational studies structure / function predictions in these unusual ATP synthases. 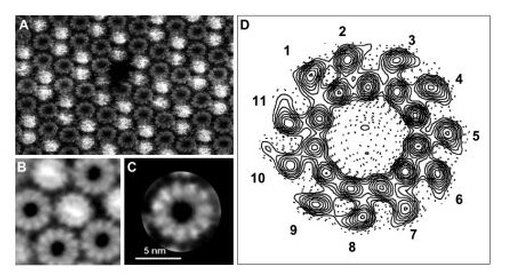 High-resolution AFM topographs (A-C) and electron micrographs (D) of reconstituted c rings from Acebacterium woodii. Each ring is either neighbored by rings either exposing their wide or narrow ends. Reference free correlation averages of the different assemblies revealed 11 masses forming wide and narrow end of the rings. (D) shows a projection map of 13 merged images at 5 Å resolution. One unit cell of plane group p22,2, with its symmetry elements (two-fold rotation axes and screw axes) is indicated. The unit cell measures 100.3 x 108 Å and contains four c rings. Structural model of the A1Ao ATP synthase from Pyrococcus furiosus based on single particle analyses. 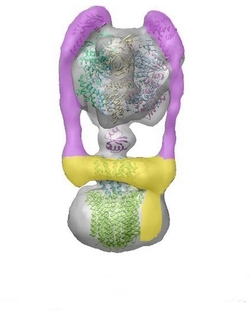 X-ray structures of subunits from F- or A-ATP synthases were fitted into the map. The a subunit is given in yellow, the two peripheral stalks are made by EH-dimers (pink), and the size of the Ao domain is sufficient to harbour the 16-hairpin c-ring from Enterococcus hirae. Brandt K, Müller D, Hoffmann J, Langer J, Brutschy B, Morgner N, Müller V (2015) Stoichiometry and deletion analyses of subunits in the heterotrimeric F-ATP synthase c-ring from the acetogenic bacterium Acetobacterium woodii. FEBS J 283, 510-520. Spahn S, Brandt K, Müller V (2015) A low phosphorylation potential in the acetogen Acetobacterium woodii reflects its lifestyle at the thermodynamic edge of life. Arch Microbiol 197, 745-751. Gloger C, Born AK, Antosch M, Müller V (2015) The a subunit of the A1AO ATP synthase of Methanosarcina mazei Gö1 contains two conserved arginine residues that are crucial for ATP synthesis. Biochim Biophys Acta – Bioenergetics 1847, 505-13. Mayer F, Lim JK, Langer JD, Kang SG, Müller V (2015) Na+ transport by the A1AO ATP synthase purified from Thermococcus onnurineus and reconstituted into liposomes. J Biol Chem 290, 6994-7002. Matthies D, Zhou W, Klyszejko A, Anselmi C, Yildiz Ö, Brandt K, Müller V, Faraldo-Gómez JD, Meier T (2014) High-resolution structure and mechanism of an F/V-hybrid rotor ring in a Na+-coupled ATP synthase. Nat Commun 5, 5286. Lim JK, Mayer F, Kang SG, Müller V (2014) Energy conservation by oxidation of formate to carbon dioxide and hydrogen via sodium ion current in a hyperthermophilic archaeon. Proc Natl Acad Sci USA 111, 11497-502. Grüber G, Manimekalai MSS, Mayer F, Müller V (2014) ATP synthases from archaea: The beauty of a molecular motor. Biochim Biophys Acta - Bioenergetics 1837, 940-52. Mayer F, Müller V (2013) Adaptations of anaerobic archaea to life under extreme energy limitation. FEMS Microbiol Rev 38, 449-72. Brandt K, Müller DB, Hoffmann J, Hübert C, Brutschy B, Deckers-Hebestreit G, Müller V (2013) Functional production of the Na+ F1FO ATP synthase from Acetobacterium woodii in Escherichia coli requires the native AtpI. J Bioenerg Biomembr 45, 15-23. Mayer F, Leone V, Langer JD, Faraldo-Gómez JD, Müller V (2012) A c subunit with four transmembrane helices and one ion (Na+) binding site in an archaeal ATP synthase: Implications for c ring function and structure. J Biol Chem 287, 39327-37. Schlegel K, Leone V, Faraldo-Gómez JD, Müller V (2012) Promiscuous archaeal ATP synthase concurrently coupled to Na+ and H+ translocation. Proc Natl Acad Sci USA 109, 947-952.